I have always said that Peopleware should be required reading for anyone who manages software developers. I’ve also said that if you want to know my philosophy as a manager, just read Peopleware. However, the first edition was written in 1987 and the second edition, which I had read, was written in 1999. I decided to read it again. I was curious to see how it holds up more than ten years later. On second read, it is clear that Peopleware was written prior to the agile wave in software development. However, Peopleware was such a prescient work that in 2011 I still found it to be insightful and compelling. Much of what they call for has become more commonplace since 1999. As DeMarko and Lister railed against public address systems in the office, I felt like I had taken a trip back in time. However, the principle that management too often optimizes the wrong factors in the workplace is as relevant as ever. I’ve seen too many situations where more care was put into color schemes and aesthetics than the mechanics of how the software team would work together (acoustics, workstation configuration, etc.). The insights and anecdotes on management of software people made the second reading worth the investment. The chapters on building a high performing, jelled team were especially valuable. 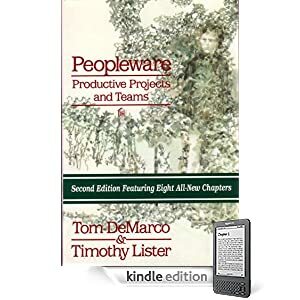 Bottom line… I still believe that everyone in software should read Peopleware and that managers must read it. This entry was posted in Agile, General and tagged Agile, books, management by efarr. Bookmark the permalink.